We're taking a 1/2 step towards podcasting new episodes of Some Assembly Required, by discontinuing our original plan of working backwards through the second year... However, we're not jumping straight to episode 133 (which is airing this week, in the 2nd half of our 3rd year in syndication, on the radio). We are instead going to start (next week), at the first episode of our third year in syndication (episode 105). For the record, what this means is that we succesfully podcast exactly one half (the last half) of our 2nd year in syndication (episodes 79-104), before switching gears. From now on we'll be going forward, chronologically, and the podcast will now stay approximately one half year behind the current episodes (airing on 24 stations across the US and Canada), starting next week with episode 105. Why the big change? Well, the library has really blown up over this past year, and you can really tell when looking at the playlists. The first year and a half were great, but nowhere near as diverse as things have gotten lately. While we'll eventually get back to podcasting those first episodes, for now it just makes more sense if the episodes being podcast bear more than a passing resemblance to what is currently being heard on the air - from a promotional perspective, at the very least. So, stay tuned. As we head into the last half of our third year in syndication, on the air, we'll be heading into the first half of our third year, online, via the podcast, starting next weekend. Another good aspect of this new direction for the podcast (for those of you who are paying attention to both the new and old episodes), is that if you like a particular episode on the radio, just wait six months, and there it will be for you to download via the podcast. Yeah. Wolfram is one of those artists who just came out of nowhere. I get a lot of CDs in the mail these days, and this was one which actually fit the format of the show. The disc I received was just one of a three disc compilation (Projekt Drei), sent as it was the one CD, of the three, which included samples. I wrote Wolfram about the SAR Q&A and Dominik Kowalczyk wrote back with some answers about the project. English is not his primary language, so the answers are sometimes brief - I'm thankful he took the time he did! *Tape manipulations, digital deconstructions or turntable creations: Digitally constructed compositions basing on digitally deconstructed samples/recordings. *What is your creative/artistic background: All started in the end of '80's ('87 or '88), when I was involved in some mail-art exchanges. These days I've made some 12 cassettes with sound collages basing as a source mainly on radio and tv broadcasts. All of them were made in really primitive analogue way, using several cassette decks, and home-made delay. Each tape was unique, containing hand made graphics and inserts. And all of them were lost or sent to other people in mail-art actions. After some break, in the beginning of '90's (1991-3) I was equipped with an old and malfuncional Weltmeister electric organs, made in former GDR (East Germany), Casio SK-1, Roland TR-505, Boss Guitar Delay DS-1, some microphones and cassette decks. I was trying to find some ideas of sound which succeeded only partially. Later on, around 1996, I was collaborating shortly with Marcelo, leader of Morris Generativ (an industrial-pop group), and these were my first stage appearances. It resulted with one limited edition cassette "Grupa PC" (The PC Group). 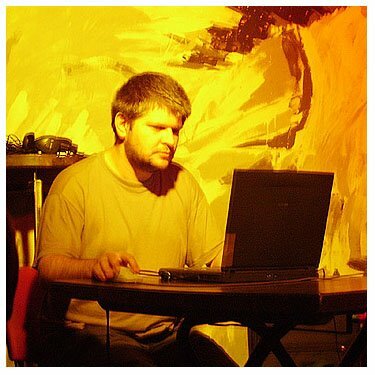 From the end of 1996 I was co-funding Neurobot Elektrozine (together with Jacek Staniszewski) neurobot.art.pl and less than two years later it was transformed into the trio (after third member: Artur Kozdrowski, joined) playing improvised noise music. Neurobot as a band was active till July 2003, playing total 23 concerts in Poland, Germany and Austria. Neurobot released 3 CD, the fourth is still planned. From year 2000 I play solo, in incidental line-ups, and recently with my new group Komora A. I released 6 solo records (mainly CDRs) with ambient and noise music + a bunch of exclusive tracks for compilations. My first release from 2000 "Projekt Drei" consisted of three 3" CDRs representing three fields of my interest these days: plunderphonics, techno, and noise. Further albums oscillated between ambient and noise but I was still thinking about next plunderphonic thing, collecting weird music, samples and ideas. It's a lot of work, but I hope to finish it by the end of the year. *Motivations: Because I really need and want to do it. It gives me satisfaction. It's less than regular work and more than a hobby. *Philosophy: No philosophy or ideology. *How would you like to be remembered: Like a guy who is not giving a s***. In other news, Relay #2 went off without a hitch. Thanks to all of you who came out to support us at Rosalux Gallery on Friday. Stay tuned for the last of the summer series in August. I'll be sure to remind you, closer to the date (Aug18). In the meantime, I'll be DJing a party at Mira Gallery on August 4th, featuring artwork by Andrew Braunberger, Aldo Moroni and Susan Opitz. More info about the show at: www.c4ia.org and I'll remind you next week, of course. Until then, thanks for listening (and tune in next week for big changes)!